Democratic congressmember from Washington state. On June 9, she visited with some of the 200 asylum seekers held at the SeaTac Bureau of Prisons facility in her home state. Outrage is growing over the Trump administration’s separation of children from their parents along the U.S.-Mexico border. On Monday, ProPublica released audio from inside a U.S. Customs and Border Protection facility, in which children estimated to be between the ages of 4 and 10 years old are heard crying “Mama” and “Papi” after being separated from their parents. In another part of the audio, a Border Patrol agent is heard joking, in Spanish, “Well, we have an orchestra here. 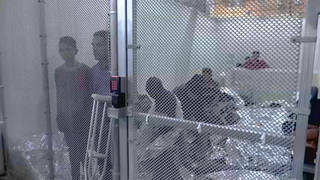 What’s missing is a conductor.” Video footage released by the U.S. Border Patrol Monday shows migrant children in concrete-floored chain link cages in an old warehouse in McAllen, Texas. A new Quinnipiac poll shows roughly two-thirds of U.S. voters oppose separating children from their parents at the border. About 7 percent of Democratic voters support the Trump policy, while 55 percent of Republicans support it. We speak with Rep. Pramila Jayapal, Democratic congressmember from Washington state. She has just helped announce a march on Washington and cities nationwide on June 30 against family separation. She is vice ranking member of the House Budget Committee and vice chair of the Congressional Progressive Caucus. On June 9, she visited a detention center in her home state and spoke with some of the 200 asylum seekers held at the SeaTac Bureau of Prisons facility. JUAN GONZÁLEZ: Outrage continues to grow over the Trump administration’s separation of children from their parents along the U.S.-Mexico border. On Monday, the news outlet ProPublica released audio from inside a U.S. Customs and Border Protection facility in which children, estimated to be between the ages of 4 and 10 years old, are heard crying “Mamá” and “Papá” after being separated from their parents. A warning: The audio is disturbing. AMY GOODMAN: In another part of the audio, a Border Patrol agent is heard joking in Spanish, “Well, we have an orchestra here. What’s missing is a conductor.” Video footage released by the U.S. Border Patrol Monday shows migrant children in concrete-floored chain link cages in an old warehouse in McAllen, Texas. JUAN GONZÁLEZ: A new Quinnipiac poll shows roughly two-thirds of U.S. voters oppose separating children from their parents at the border. About 7 percent of Democratic voters support the Trump policy, while 55 percent of Republicans support it. Ahead of today’s meeting with Republicans to discuss compromise legislation on a hard-line immigration bill, President Trump continued to blame Democrats for his policy that has led to the separation of at least 2,000 children in recent weeks. PRESIDENT DONALD TRUMP: The United States will not be a migrant camp, and it will not be a refugee holding facility. Won’t be. You look at what’s happening in Europe, you look at what’s happening in other places, we can’t allow that to happen to the United States. Not on my watch. … If the Democrats would sit down instead of obstructing, we could have something done very quickly—good for the children, good for the country, good for the world. It could take place quickly. We could have an immigration bill. HOMELAND SECURITY SECRETARY KIRSTJEN NIELSEN: DHS is not separating families legitimately seeking asylum at ports of entry. If an adult enters at a port of entry and claims asylum, they will not face prosecution for illegal entry. They have not committed a crime by coming to the port of entry. As I mentioned, DHS does have a responsibility to protect minors, and in that case, as well, we will only separate the family if we cannot determine there is a familial relationship, if the child may be at risk with the parent or legal guardian, or if the parent or legal guardian is referred for prosecution. We have a duty to protect the American people, and it’s one that I take very seriously. AMY GOODMAN: For more on the response to the Trump administration’s new policy of separating children from their parents at the border, we’re joined here in New York by Congressmember Pramila Jayapal, Democratic congressmember from Washington state. She has just helped to announce a march on Washington and cities nationwide on June 30th against family separation. She’s the vice ranking member of the House Budget Committee and vice chair of the Congressional Progressive Caucus. On June 9th, she visited a detention center in Washington state and spoke with some of the 200 asylum seekers held at the SeaTac Bureau of Prisons facility. Congressmember Pramila Jayapal, it’s great to have you back. AMY GOODMAN: Talk about the latest explanation. Some thought yesterday, possibly because of the just national, international outcry, that President Trump would walk this back. But he hasn’t. He has dug down. REP. PRAMILA JAYAPAL: He has dug down, doubled down. And I’ll tell you, I think he’s making a bad miscalculation. Americans across the country—Republicans, Democrats, independents—are outraged, because everyone—there are so many parents amongst us. And you have to, as a parent, think about—and as a mother, I can tell you this—think about what it means to take a child who is breastfeeding, and tear her off the breast of a mother, to take a 1-year-old child. And I heard from the 174 women that I met with at the federal prison—they’re being held at a prison because all the detention centers are filled. These are 206 individuals who were transferred from Texas, from the border, to a federal prison. Some of them, about 40 percent of them, had been in detention for over a month. Not a single one of the mothers had seen their children. Not a single one of them had been able to say goodbye to their children. And only two out of the—all of the mothers that were there even knew where their children were. So, Trump is making a bad miscalculation. He has said, over and over again, that he is using this as leverage to get his border wall, to get very bad immigration policies that would cut legal migration to this country over the next many decades, policies that really very few people support. He continues to use immigration as a piece of red meat that he throws to an increasingly shrinking, in my opinion, base. And you can see that by the fact that Franklin Graham, son of Billy Graham, Laura Bush, former first lady, have all weighed in to say this is cruel, it’s immoral. And, by the way, it also doesn’t work. It is not an effective deterrent, because the women that I met with—you’ve covered so many of these countries over the years, over the decades—they are escaping terrible conditions. One of the women told me that she had three children. Her oldest child was shot and killed by gangs. I think she was from El Salvador. Her second child, shot and paralyzed by gangs. She took her third child—left her second child and took her third child to try to bring that child to safety. These are the kinds of stories that people are fleeing. So they’re making impossible choices. And separating children from their families at the border is illegal. The U.N. human rights commissioner has weighed in and said it violates the rights of the child. They are asylum seekers. They should be getting what is called a credible fear hearing. And instead, the Trump administration just continues to double down and think that he’s going to somehow be solving a problem here. JUAN GONZÁLEZ: What’s your response to the claims of President Trump and his aides that they are only following the law, that the law had been in place beforehand but was not being followed by prior administrations, and they feel they now must follow the law? REP. PRAMILA JAYAPAL: It is just hogwash. I could use a lot of words for it, but I’m going to say “hogwash” here. This is a result of the Trump administration’s “zero tolerance” policy. What they did when they put that into place—and you hear Jeff Sessions talk about it back in February, various people have talked about—this was actually done to deter people from coming, which, by the way, is illegal. Our courts have ruled that you cannot use detention as deterrence. But what they have done now is said, “We’re going to criminally prosecute everyone who comes across the border, including these asylum seekers.” Now, the majority of the 174 women that I spoke with were asylum seekers. Not a single one had received a credible fear hearing. And they had been taken into courts en masse, 75, 100 people at a time, mass prosecutions, really no due process, criminally prosecuted when really what they should have gotten is a credible fear hearing. JUAN GONZÁLEZ: And clearly, there’s no way to adjudicate an individual’s credible fear of persecution if they are in a group—in a group trial. REP. PRAMILA JAYAPAL: That’s right. And it was a criminal prosecution. It was not an asylum hearing. And they didn’t—they weren’t evaluated at all. There is a question, too, by the way. Some of these folks have been pleading guilty, because—in fact, all of them have, because they hope that they’re going to be reunited with their children if they do that. And instead, you know, what might happen is, when you apply for asylum, you’re asked, “Have you been charged of a crime?” This is technically a crime. So we don’t know yet how this will affect their asylum hearings. But the stories I heard were just heartbreaking, women who talked about being deceived. They were with their children. They turned themselves in. They were then—you know, excuses made, like, “You’re going to go get a photograph taken” or “You’re going to go to court and see a judge.” And they came back, and their children were gone—no chance to say goodbye. Some of them talked about being in the room right next door to their children, so they could hear them screaming for them, crying for them. You showed pictures of the cages that people—that children were held in. The women described the same things. They talked about the facilities by nicknames, like “the icebox” and “the dog pound.” Icebox because the temperatures were so frigidly cold. And they cross the Rio Grande: They’re wet. They’re put into these frigidly cold facilities—no mats, no blankets, no clean drinking water, in some cases, for up to five days. So, the administration would love to take the focus off of the fact that they put this policy in place. They can reverse it today. They would love to have the focus turned to legislation that both sides need to pass, but that is just not true. AMY GOODMAN: And you visited prison—we’ve seen the congressmembers who went en masse to Texas. They were in McAllen. 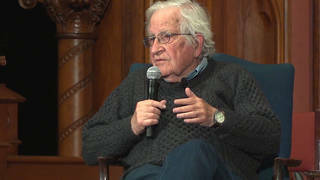 AMY GOODMAN: They were in all different places. You’re a congressmember from Washington state, and you were in Washington state. These women were flown up from the border. AMY GOODMAN: Their children still, presumably, in Texas? REP. PRAMILA JAYAPAL: All over the place. So, some of the women were given slips of paper that had their name, their A-number, which is their immigration number, and then the names of the children—their children, supposedly. But one woman pointed to the slip of paper and said to me, “These are not my children.” So there is a real question also about whether these agencies—because there’s the U.S. Marshals, there’s Customs and Border Protection, there’s Immigration and Customs Enforcement, there’s DHS, there’s the Office of Refugee Resettlement. Nobody knows—and we have not been able to get the answers to—whether or not these agencies are coordinated and whether or not they actually know where these children are. Not a single one of these women—actually, I take that back—two women had known where their children were, but had not spoken to them. But the rest of them had no idea where they were. AMY GOODMAN: This was in the same—at the same time—well, yesterday and a few days ago, when she spoke—that she said the separations aren’t happening. REP. PRAMILA JAYAPAL: Right. She has gone back and forth, as has Trump. But we have it on record that this is a policy that has been carefully crafted by Stephen Miller, put into place by the Trump administration. They are now—and Trump himself has said that he wants to use this, use the children, as leverage to get his border wall and to get his regressive immigration policies. We have been saying, over and over again, that what they are doing can be undone today by the president, does not require congressional action. This does not need to be about legislation. And I would just say that the Ryan bill that is going to come to the floor of the House this week, that they say offers a fix to this, actually makes things much worse. It allows for family detention indefinitely. It takes away the due process rights that unaccompanied children would get. It is a terrible bill. So anyone who says it’s a moderate compromise is really missing the boat. And we should vote those bills down. Hopefully, they will both fail. But then the Trump administration must implement a reversal of this policy. And we’ll have a mass demonstration, anchored by MoveOn and also by the National Domestic Workers Alliance, June 30th, Lafayette Park, 11:00, hundreds of organizations, unions, faith leaders, all kinds of organizations that are participating, because I think people really are outraged. And we should be outraged. These conditions are cruel. JUAN GONZÁLEZ: —to supersede the president in this case? REP. PRAMILA JAYAPAL: I mean, I would love to see congressional action, but I don’t think that they should be able to try to say that if this policy continues, that it’s the failure of Congress, because he put this into place. And he has a habit of doing this, Juan. As you know, he did this with the DREAMers. He said, “I’m reversing DACA. Now it’s Congress’s fault that they haven’t passed a solution, a permanent solution, for the DREAMers.” And he was challenged by that by his own party for a period of time. They have now backed down, and that’s why we’re seeing this bad legislation. But he creates crises. He preys on fear. Even his comments about Europe and immigrants in Europe, that you had played earlier on the show, are all about creating a crisis of fear that literally has people afraid that immigrants are causing these problems. I would like for every American to hear these mothers that I spoke to at the federal prison, who are so courageous, have left—made so many sacrifices in order to come to the United States seeking asylum. As much as Trump would like to portray people coming across the border as murderers and rapists and, you know, all of the terrible things that he says—animals—these are women seeking asylum, seeking security. And I think that these families need to be reunited. AMY GOODMAN: So, talk about what’s happening today. I mean, there’s this astounding poll that’s out that says something like 90, 95 percent of Democrats are opposed to what Trump is doing, but something like 58 percent of Republicans are supporting what he’s doing right now. He is going—Trump is going to Capitol Hill. What are these two bills that are being put forward? And what are you instead proposing? REP. PRAMILA JAYAPAL: There are two bills. One is from Bob Goodlatte, the chairman of the Judiciary Committee, which I sit on that committee. And that bill is a very conservative, anti-immigrant bill that would cut legal immigration over the next five decades by 25 million. So, it eliminates pieces of the family immigration system. It really eradicates the refugee and asylee process. It does not provide a path to citizenship for undocumented immigrants. It is a bad bill. Ryan then crafted, with some folks from different parts of his caucus, another bill that is supposed to be the compromise bill, because it does offer some things towards the DREAMers, which he was pushed to do that by the fact that there were almost 218 signatures on a discharge petition that essentially would allow for four bills to come to the floor. One would have been the DREAM Act, one would have been the Hurd-Aguilar bill, one would have been the Goodlatte bill, and one would have been Ryan’s bill. He did not want that to happen. It would have forced his hand. And actually, the Herd-Aguilar bill, which would have provided a permanent solution for DREAMers, that bill would have passed. It would have gotten enough votes to pass. And he didn’t want that to happen, so instead he said—he worked a compromise with his caucus, and, unfortunately, a couple of the moderates backed down, and said, “I will bring this other Ryan bill to the floor.” That bill has a few things to sort of calm the fears of some of the moderates, who are worried about their re-election prospects, but it also does many of the terrible things that we know he would want to do. It has a lot of the pillars that Trump wanted in his proposal. AMY GOODMAN: —from the Republican lawmakers could lift the 20-day limit currently in place for families to be detained, and pave the way to unlimited detention of parents and their children? AMY GOODMAN: This is the compromise bill? REP. PRAMILA JAYAPAL: That is the compromise bill. And so, I refuse to call it a compromise bill. I call it an anti-immigrant bill, along with the Goodlatte bill. And anybody who thinks that bill is fixing the problem that we have at the border has another think coming. This is indefinite detention for children. AMY GOODMAN: So, is this what this is all about, is that Trump made the stakes so high that people would simply cry uncle, and he would say, “See, Democrats aren’t supporting a bill that will stop the children from being separated from their parents,” and that it would be a small price to pay, $25 billion for a wall? REP. PRAMILA JAYAPAL: Well, the crazy thing is, he actually could have had the wall. Chuck Schumer—without our knowledge, I want to say, or some of our knowledge—offered him a wall. He then changed the stakes, and he said, “No, I don’t just want a wall. I want you to end the family immigration system. I want you to do this. I want you to do that.” So the goal posts kept moving. It isn’t about the wall anymore. It’s just he wants immigration to be out there as an issue for his base. But I think he is miscalculating on this one. I really do, because I think there are very few Americans—and I know what the polls say about 55 percent of Republicans currently supporting the proposal, but that number is going down very quickly. And the more we hear these cries of children and see these images of children in cages—they don’t want to allow us in, because they don’t want people to really see. But now people are starting to go in and to see what kinds of conditions we’re holding people in. I thought Laura Bush’s article was excellent, actually, her op-ed, where she talked about the comparisons to history. JUAN GONZÁLEZ: And yet he continues to create this image that immigration is associated with—greater immigration is associated with greater crime. REP. PRAMILA JAYAPAL: From India. I was born in India. This portrayal of immigrants—and by the way, unless you’re Native American, you did come—your ancestors came from somewhere, either on slave ships to build this country, under pressure, or to escape persecution, but came from somewhere else. And for Trump to insinuate—not just insinuate, to claim—that immigrants are this terrible threat, he is using a time-tested formula, but he is absolutely wrong. It is offensive. And it is leading to some cruelty that I thought would never be possible in the United States of America in this day and age. AMY GOODMAN: We’re going to break, then come back to this discussion. We’ll be joined by Sheila Jackson Lee, congressmember from Houston. We’re talking to Congressmember Pramila Jayapal, Democratic congressmember from Washington state. On June 9th, she visited, oh, some of the 200 asylum seekers who are being held in a prison in her home state. This is Democracy Now! We’ll be back in a minute. AMY GOODMAN: “Would You Harbor Me?” performed by the Labyrinth Choir, here on Democracy Now!, democracynow.org, The War and Peace Report. I’m Amy Goodman, with Juan González. Still with us is Pramila Jayapal, Democratic congressmember from Washington state. Before she came into the Congress—in 2016, she was elected—she was the head of OneAmerica, a large immigrant organization in Washington state, and now has gone to the prison in Washington state to see some of the hundreds of asylum seekers held at the SeaTac Bureau of Prisons, who were brought up from the border. With us in just a moment—she’ll be speaking to us from Statuary Hall—will be Sheila Jackson Lee, who is running over to take her position. But that issue of all of these women—very interesting, the role the women are taking, also that Trump is trying to make women the face of his policy. AMY GOODMAN: Kirstjen Nielsen, the Department of Homeland Security, reportedly even with Kelly, the chief of staff, not wanting her to hold that news conference, she owned it yesterday. AMY GOODMAN: Of course, Sarah Huckabee Sanders, who has been standing with the president on family separation each day as she’s in front of the podium. REP. PRAMILA JAYAPAL: Yes. I think that—you know, I have read mixed things about Kirstjen Nielsen. I heard that she did not like this policy, but she is clearly standing up for it now, after having denied that it existed, you know, just a few days ago. But I do think that the former first ladies of both parties speaking out is an indication to us that all Americans must be feeling this deep sense of cruelty and outrage. I took over a Judiciary Committee hearing last week that was about other bills, when we should have been having a hearing on this. And I said, “We are outraged.” And I have to believe that there are good people on the other side, mothers and fathers, who, if they don’t say something today, are going to have to go back to their children and explain why they did nothing as we put children into kennels and tore them away from their mothers. It is absolutely outrageous. JUAN GONZÁLEZ: And you’ve alluded to the issue of many of the Republican moderates fearful how this is going to affect their re-election efforts. I’m wondering, in your conversations in the halls of Congress with some of those moderates, what they might say to you privately? REP. PRAMILA JAYAPAL: You know, the frustrating thing is, many of them, not just on this issue, but even on other issues—removal of coverage for pre-existing conditions that the Trump administration has just done—people say to me, “Yeah, this is terrible. This is going to be very bad for us. This is bad for the country.” I mean, they will say things like that, but they are terrified of taking on the bully that has the bully pulpit of the White House.